Theatr Brycheiniog TheatreTheatr Brycheiniog has established itself as one of the leading middle scale venues in Wales, presenting an extensive and diverse programme. Opened in 1997, it provides a theatre auditorium, art gallery, conference venue, restaurant with local Welsh cuisine, a bar, and community spaces and offers excellent views of the Brecon Beacons National Park. Theatr Brycheiniog has established itself as one of the leading middle scale venues in Wales, presenting an extensive and diverse programme. The venue is attracts acts ranging from stand up comedians to folk singers. From Hereford A483. Do not take the first signpost for Brecon on the right, instead go to roundabout and follow the sign for Brecon, carry on straight past the Army Barracks until you reach a mini roundabout and take the next turning left (Rich Way). 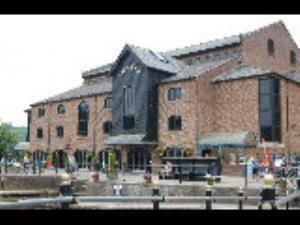 Follow on to next mini roundabout and turn left, Theatr Brycheiniog is next to the canal basin. From Abergavenny (A40) After the dual carriageway you will come to a main roundabout, take the road into Brecon and follow the directions as above. From Merthyr / Sennybridge Take the road into Brecon over the Usk bridge carry on straight through the town, past the statue, over a zebra crossing and approx 150 yards turn right into Rich Way. Theatr Brycheiniog is on the left by the canal.